A unique collection of 24 ADC cytotoxins for targeted therapy research. • Nat Microbiol . 2018 Nov;3(11):1266-1273. • Nat Commun . 2018 Oct 8;9(1):4139. • Nat Commun . 2018 Apr 30;9(1):1726. • Dev Cell . 2018 Sep 24;46(6):681-695.e5. • J Control Release . 2018 May 10;277:23-34. • Thyroid . 2019 Mar 29. • New Phytol . 2018 Oct;220(2):476-487. • Int J Cancer . 2015 Sep;137(6):1457-66. • J Hematol Oncol . 2018 Aug 13;11(1):102. • J Hematol Oncol . 2018 Mar 20;11(1):44. • Mol Ther . 2019 Feb 15. pii: S1525-0016(19)30050-4. • J Exp Clin Cancer Res . 2016 Nov 7;35(1):173. 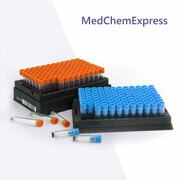 • A unique collection of 24 ADC cytotoxins for targeted therapy research. • Used to develop new antibody-drug conjugates targeting cancer. • Bioactivity and safety confirmed by preclinical research and clinical trials.